Geosynthetics allow the development of mass transit airport connections for earthquake-prone Indonesia. Stabilized soils and embankments provided long-lasting solutions that save time and money for thousands of people every day. Construction in earthquake-prone Indonesia, the world’s largest archipelago with over 18,000 islands, poses unique challenges in ground stabilization. The archipelago sits between the world’s two most active seismic zones, the Pacific Ring of Fire and the Alpide Belt. Jakarta, the capital, also faces challenges of low-stability soils and a high watertable. Since 1983, Indonesia has used geosynthetics to protect from earthquake-induced geotechnical hazards. 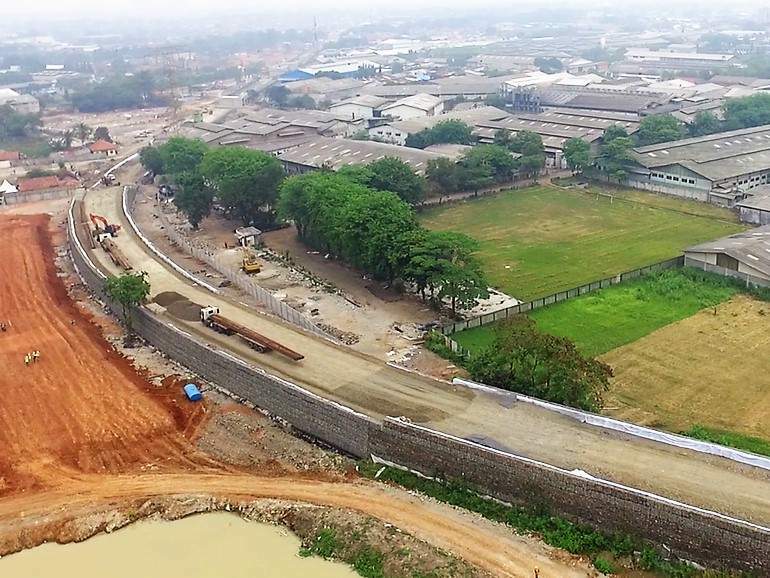 A recent project made possible by the use of geosynthetics is the Ba-Soetta Line of the Soekarna-Hatta Airport Rail Link. This 12-kilometer connection between Jakarta city center and Soekarna-Hatta International Airport (SHIA) provides a vital supplement to the congested and flood-prone road network for over 60 million airport users a year. The rail line will halve travel time and serve approximately 11,000 people a day. The railway route crosses city drainage systems, urban roads and former paddy fields, requiring bridges, culverts, and over 6m of steeply graded soil embankments. Through a collaborative design process, the project team was able to reduce both project cost and construction time from original expectations. To create the embankment, a back-to-back Mechanically Stabilized Earth (MSE) wall was coupled to a foundation improved by soft soil replacement and basal reinforcement. MSE walls are reinforced soil structures with a horizontal inclination over 70 degrees consisting of multiple layers of planar reinforcing elements. Placing tensile reinforcing elements (inclusions) in the filling soil increases its strength significantly, allowing the near-vertical soil/reinforcement system to be temporarily self-supporting. MSE walls can tolerate larger total and differential vertical defections than rigid walls. The Ba-Soetta railway project required a range of solutions. In sections wher19e the embankment was 6m to 13m high, the design included flexible terramesh system facing combined with geogrid reinforcement. The geogrids were laid from one side of the embankment to the other side with no mechanical or frictional joints. This hybrid MSE structure combines metallic and polymeric elements to reinforce and stabilize. The variable structural load of trains needed to be considered. Part of the route had previously been used as paddy fields and had an average of 3m of soft clay topsoil. To meet the required safety factor and limit deformation, the clay was removed and replaced with a well compacted granular fill, with nonwoven geotextile separating it from the existing soil. This was followed by a double layer of high strength geogrids (oriented longitudinally and transversally) to serve as basal reinforcement. The SHIA Rail Link began operation at the end of 2017.